SAN FRANCISCO: Quite possibly the most versatile vehicle on the planet. 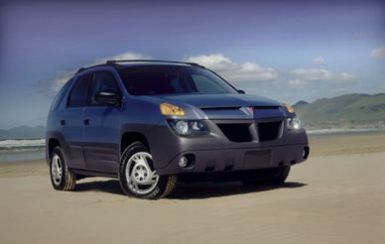 That's Pontiac's slogan for its new Aztek  a cross between a sport utility vehicle, a minivan and a small RV. But my friend Mike Lewis said from the outset that the Aztek could not be considered a truly versatile vehicle unless it has an all-wheel drive system. Well, either Pontiac heard Lewis or my friend has an inside track in the automotive industry. Initially, traction control was available, but Pontiac now offers an all-wheel drive system on both trim levels  the base Aztek and the upscale GT. So, along with everything else the Aztek offers  outdoor amenities, a powerful engine and uncommon looks  this new vehicle also offers an all-wheel drive system that can help on slick roadways and minor off-road conditions. The most common comment I heard immediately after I picked up the 2001 Aztek tester was "If you can get past the looks, it's pretty cool." But my wife Paula actually liked the exterior styling, saying it was unique. That's an understatement. The front end is really different. But the rear end leaves you with an either love-it-or-hate-it feeling. It reminded me of a very big hatchback on a small coupe. The Aztek is basically a converted minivan, based on the Pontiac Montana's chassis  although the Aztek is several inches shorter. But the Aztek still is bigger than your typical mini SUV like the Toyota RAV4 and the Honda CR-V. The Aztek is even longer and more spacious than my favorite sport-ute  the Nissan Xterra. And the Aztek has more headroom and rear seat legroom than the Xterra. The Aztek also outpaces these competitors in the engine performance department with its General Motors 3400 V6 that puts out 185 horsepower and 210 pounds of torque. In a 0-60 mph race, the Aztek can outgun the Mitsubishi Montero Sport and Jeep Cherokee Sport. But the truly amazing thing about the Aztek is its interior. The dashboard layout is really neat with oversized buttons and knobs for easier access. Everything either has a rubberized or hard plastic feel to it that provides a real outdoorsy persona to the Aztek. My test Aztek did not come with the optional pop-out tent, air mattress and integrated air pump, though. Nor did it have the sliding rear cargo tray. And I wasn't even fortunate enough to get an Aztek with the built-in insulated cooler that doubles as a CD holder between the bucket seats up front. The GT even has portable utility packs that stow in the front doors until you're ready to pull them out, fill them with stuff and head off into the woods or down to the beach. The hiking package includes backpacks that attach to the backs of the front seats when not in use, heavy-duty rubber floor mats and water-resistant seat covers. Another package includes a rooftop or interior bike rack that hold two cycles. These are all options available on the GT Aztek. But what is available on all Azteks are cool things like lantern hooks on the liftgate, cargo area stereo controls and four 12-volt power outlets. The rear tailgate has cupholders and is molded to form two seating areas. In other words, the Aztek's tailgate is made for tailgate parties, especially with easy access to the stereo controls. Instead of the removable cargo tray, the base Aztek features a cargo net system that can be configured 22 different ways. This is great for groceries, sporting equipment or anything else you don't want rolling around in the back. Remove the rear seats and you're left with more than 95 cubic feet of cargo space. That's more than the maximum rear cargo space in a Dodge Durango, Jeep Grand Cherokee and almost as much as the Mitsubishi Montero. Column Name: "The Most Versatile Vehicle on the Planet"